Current and past training logs. You manage what you measure! 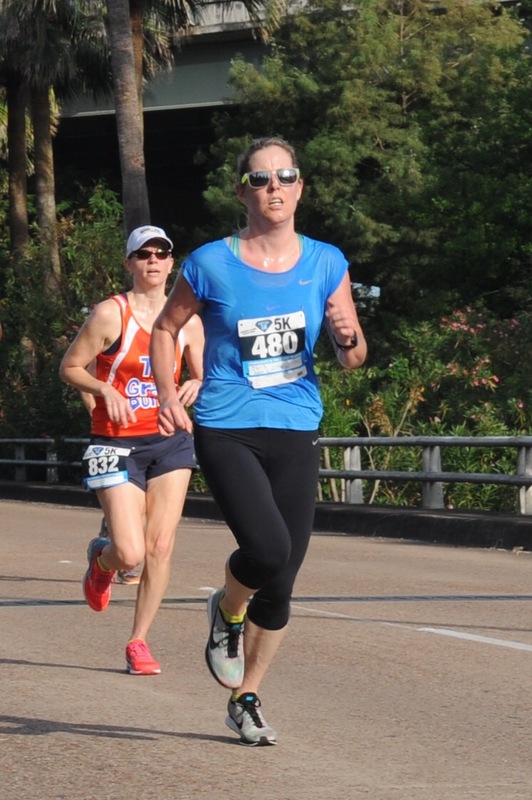 Race Recap: Dad’s Day 5k- Dedicated Training = Personal Best. Thoughtful & consistent training pays off with a new PR. Sunday I ran the race I trained for, and though the time I saw when I crossed the finish line marked the achievement of one goal, I took it as a bench mark of two different paths I want to continue on. The two goals are intertwined; I want to become the best competitor in running that I can push myself to be, and I also want to be a useful training coach for fellow amateur athletes who want to push their own boundaries. With training on myself, I hope that I might find good practices to pass on to my fellow athletes, whether they are full of fury for a medal, or just want to feel more confident and comfortable in community races. I’ll write about specifics, including pacing and training, lower in this post, but first I wanted to give an overview of the race. It was the “Dad’s Day 5k” in downtown Houston, Texas. I love these community races- something always chokes me up, and this one got me good. The cause was prostrate cancer, as the race fell Fathers’ Day Weekend. My own father passed away over ten years ago, and it was from him that I got the running genes, so I thought about him a lot. I don’t doubt that soaring emotions helped me get to the finish line faster, I felt pretty inspired to do my best, just in case he was watching. I found that it was a pretty big race, at least 1000 people running, more volunteering. 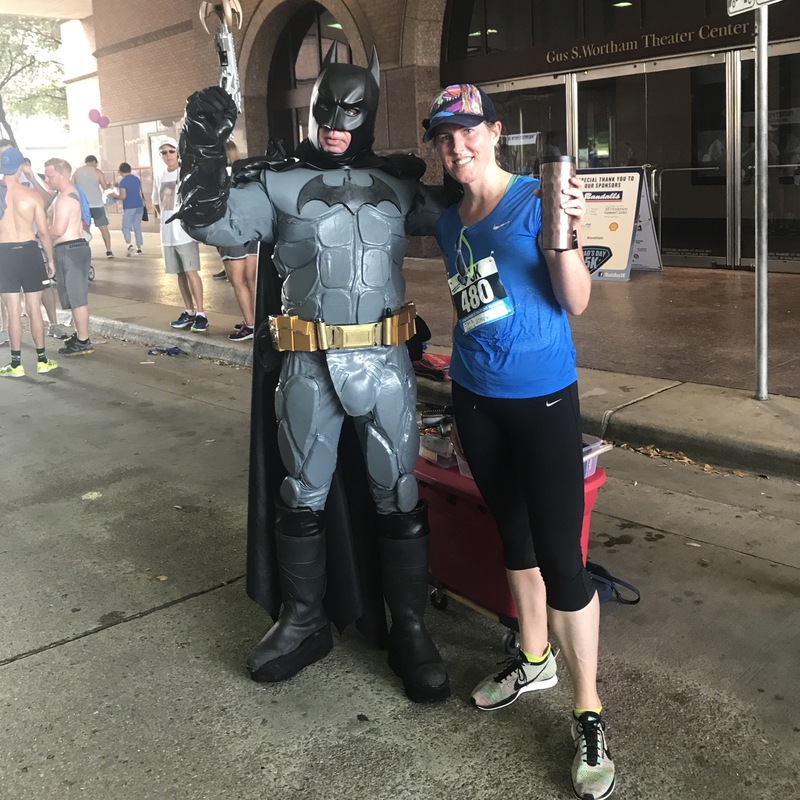 There were men dressed up as Captain America & Batman, and I grabbed a pic with Batman after the race, while waiting for the times to be posted. It was hot and humid, the stats being 80 degrees Fahrenheit with 80% humidity. I felt it as soon as I opened my car door at the race site. Those guys in the superhero costumes were seriously heroic for donning facemasks and tights in that weather! Once the race got going I felt like I was running through a volcano covered in a wet blanket. They did a kids 1k race before the 5k started, and it was of course adorable but also inspiring. The bigger kids ran really hard, and I was floored to see that a girl took 3rd place, flying in well ahead of the next kids and the pack. I lined up at the front. I finally realize that is where I need to be. Choosing a spot close to the start line is a relatively new move for me. In the past I’ve been scared it would make me go out too fast, but I finally have confidence in my training that I know my pace and can hold it, letting go of my ego, so that the people that rush out in front of me oftentimes drift behind me after a mile or so. There were signs posted from 7 min pace on up, and I marched in between it and the 8 min sign. Even with the weather, I was counting on running at the very least 7:40/mile. My previous pace for a race on about the same course was 7:50, but that was in February when the weather was much more forgiving. Never ending. It felt like forever, and I glanced at my watch, reading a 7:25 there. For a long time that would have alarmed me, as getting close to 7:30 too early in the race gasses me. I stopped looking at my watch. Legs felt good, breathing was ok. My only source of discomfort was the heat. The race was out and back, so the one mile mark meant only 1/2 a mile until I got to turn around. My pace quickened, and I didn’t really have to think about it. I was running in a pack that included a few women, and I had no way of knowing if they were hurting like I was and if they would suddenly take off. I would look at my watch, and still see times that were a little fast, 7:18 or so, and just leave the over-analyzing alone and ask the question- “Can I maintain this?”. I did, and I got faster. As I approached and rounded the turn-around, I counted nine women in front of me, making me ten. A little fear set in that I may drop out or I would get passed, which took my adrenaline up a notch. Like I said, it was bonkers hot. I even saw the photographer, and this grimace was the best I could manage. Or as I like to think of it, the oh-thank-god-its-almost-over mark. My focus became just running at my threshold. I wasn’t going to leave anything behind. I had passed a few women, and there was one in front of me that I figured would stay there, but something happened in the last 200 meters or so. I looked at my watch, and the time read 21:30. My goal PR right now is a sub-22, and though I really thought I had no more effort left to give, I surged. I got to the finish line with a 22:33, and I was really proud with that. It busted my old PR by 20 seconds, even with me being 5 years older since I set that mark. What a rush! As I crossed the finish line, I realized just how overheated I had become. I never got water in the race, not wanting to sacrifice time or stop my momentum, and as I came to the stop I realized I wasn’t altogether sure I wasn’t going to pass out. I also had to use the bathroom, and deliberated on the odds of me blacking out inside the Port-o-potty if I even made it there. YOLO, in I went, out I came, and grabbed water. As a starting point for my training, I read Jack Daniels’ Running Formula. I was mainly interested in his VDOT charts, which take performance as an indicator of VO2 max, then provide a comprehensive list of times to aim for in training for 5 different kinds of runs. Once you figure out where you land with your VO2 capabilities, you are only getting started in putting together a training program. I had to identify my strong and weak areas, and prioritize my training to condition myself what I was worst at- holding a pace through discomfort. I know I’m capable, I just haven’t always been willing! Lest I get super confusing for newer runners or people whose lexicon is different, here is how I describe and interpret my training. This is taken almost directly from JD Running Formula, I just adapted a few things within my training becuase his book describes a program for people who run way more volume (miles) than I do right now. I give a description of how interpreted and adapted the workouts for my purposes, and the paces I used, which were determined from Daniels’ charts in the book. Interval Run: 400-1000 meters run at slightly faster than 5k pace with 60-90 seconds of recovery. Reptition Run: short intervals on the track. I used 200 meter sprints, with a 200 meter recovery jog. Easy/Recovery Run: should be self explanatory, but runs of half an hour to an hour a few times a week. I ran maybe 20 miles a week. I was able to get away with relatively low mileage because I supplemented resistance training in the gym. The resistance training was more or less targeted to not just strength, but endurance, including short to no rest periods between sets targeting different muscles. What I found was that training this way conditioned my mind to push through pain and fatigue, which is just what I needed! For this race, I went in knowing what I was working with, because I had been training consistently, with progressive paces individualized to my workouts for months. I wasn’t as interested in where I placed in the field for this race. I knew this would be my last 5k for awhile, and I wanted to beat my best time. The big picture: If I placed last and ran faster than my fastest, then the race would be a success. The race was a total win. I ran hard the whole time, held on when it got really rough, and somehow found the grit to rev up even more at the end. I start training for the Houston Marathon next month, and I’m really excited to work out my training details for that race! Author shestherunPosted on June 23, 2017 February 9, 2018 Categories Races, TrainingTags 5k training, Houston running, PR, road racing, running motivation, texas running4 Comments on Race Recap: Dad’s Day 5k- Dedicated Training = Personal Best.